Happy Veteran’s Day! Today is a day to thank all military veterans and the men and women currently on active duty that put their lives on the line for the freedoms we all enjoy. 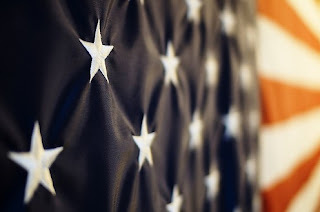 In celebration of Veteran’s Day, Dr. Mark Morrow, Dr. April Lai, and Dr. Kerry Edwards and our team would like to share a few fun facts about our flag, this national holiday, and our country’s history! -Veterans Day, a day that was originally called Armistice Day, is a time to thank and honor the men and women who have served in our military. -There are 23.2 million veterans in the U.S.
-When the flag is displayed next to another flag against a wall, the U.S. flag should be on its own right (on the left side when facing the wall). -Veterans Day is often confused with Memorial Day. Memorial Day is a time for remembering and honoring the men and women who died while serving our country, or as a result of injuries that incurred in battle. Veterans Day honors and gives thanks to all veterans who served in our military. We are so thankful for all who have and are currently serving in the U.S. and overseas!